There are three basic types of cages: bolt-in cage, prefabricated weld-in cage, and custom-made cages. Although a bolt-in cage can be very tempting due to price and a basic simplicity of installation, these types of cages are not typically as safe as other cage designs. Often times these cages were designed for use with a vehicle running in a stock class where the full interior must exist, such as SCCA’s Show Room Stock class. Because of this, the fit is typically not as good as other types of cages. Another type of cage is a prefabricated weld-in cage. When speaking with companies that make this type of cage, obtain clarification as to whether the cage was designed for a car with or without the interior in it. In addition to these companies’ off-the-shelf cages, many will design a cage built to your vehicle’s specifications. Either way, it will still be necessary to have the cage welded in. The approximate cost for a weld-in cage that is tailored to your vehicle’s specifications is $650 plus shipping. Since the parts come unassembled, shipping may not be as expensive as one might think. When speaking with the company that will be installing the cage, also talk to them about installing the window net mounting brackets. An approximate cost to have the prefabricated cage welded together in your car is approximately $550, which includes the welding of the window net brackets. Between the parts and labor, the total costs are around $1,200 not including the shipping of the cage materials. The third cage option is to have a known cage fabricator or local welding shop create a custom cage for your car. When buying a custom-made cage, it is much easier to work with a shop that has experience building cages. If you do go to a shop where this will be their first cage building experience, you will need to be more thorough when describing what the club’s cage regulations are, as well as any other needs you may have. Regardless of what shop you may choose to build the cage, bring the most current rulebook with you. Although the shop may have built 50 cages last year, they should review the rules to ensure nothing has changed. To find a shop that builds roll cages, search the internet, including racing chat forums, as well as the yellow pages, and certainly ask other racers who live in your general area for recommendations. When you compare the cost of a basic custom cage (without NASCAR style bars) to the other two types, it really is not a dramatic difference. Expect to pay between $1,200 and $1,700 for a custom cage including the welding of window net brackets. A SFI 27.1 rated window net and mounting hardware totals $35. 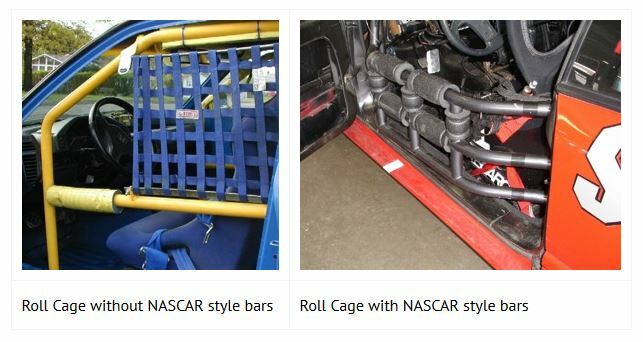 When having the cage built, you may also want to consider having it built utilizing NASCAR style bars, which offer greater protection in the event of a side impact. Once the roll cage is installed, mount some high-density roll bar padding in areas your body may have contact with. When shopping for this padding, verify that it is high-density versus “standard” roll bar padding, which is not sufficient for what you need. The typical cost for a three-foot length is $15 – $20. You should also give thought to how the racing seat will be mounted. 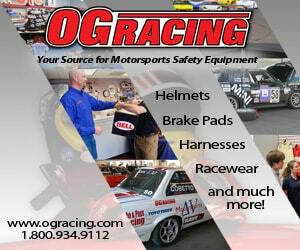 In many instances it is possible to purchase a racing seat bracket to mount the seat to the car. Whether or not that is an option, I suggest speaking with the company that will be welding your cage for their suggestions. I had the person who built my cage also build the seat mounting bracket using the stock seat’s sliding brackets. When relying on outside vendors for your roll cage needs, begin your planning early in the building process. Also, anticipate that the time frame they provide you with will expand when it actually comes down to it. Plan your other projects so that even if their time frame doubles or triples, you won’t be in a panic to complete the car build.